All transactions are safe and secure with a reliable history in online purchasing behind each of our associates. 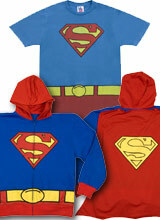 Buy the Costume Superman t-shirt or Hoodie to own Superman clothing and merchandise. Become the Man of Steel in either a great looking costume Superman t-shirt or a costume hoodie that features a button on red cape. Both items display the classic Superman shield on the front in the traditional colors of red, blue and yellow. These fun pieces of clothing are perfect to wear as quick Superman costumes or as casual fan gear that will help you to represent the classic Superman quote, "truth, justice and the American way." Whether you choose the hoodie sweatshirt or the Junk Food Superman costume tee, you'll be well prepared to woo the Lois Lane in your life. In addition to the Costume Superman tee or Hoodie above, browse the Superman Clothing Gallery for more apparel like men's and women's clothes, kids shirts or hoodies.